The various means by which sleep disorders might generally be detected and assessed are described in Ch§pieL4J.4J These subjective and objective approaches need to be modified for use with children because of the involvement of parents, developmental factors, and the differences between children and adults regarding clinical manifestations and diagnostic criteria. The detection of sleep problems can be improved by routinely asking basic screening questions as part of the history taking in any child. 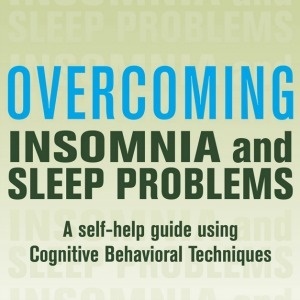 • Is there difficulty getting to sleep or staying asleep? • Is there excessive sleepiness during the day? • Are there disturbing episodes at night? This is the cornerstone of sleep assessment. Parents and also the child (if old enough) should be interviewed and the reasons for any disparities considered. The main aspects that should be covered are as follows. • Current sleep problem and its evolution. • Past treatments and their effects. d. features suggestive of specific sleep disorders. • Sleep environment and arrangements. 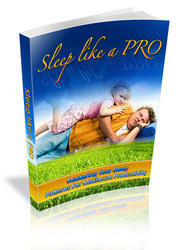 • Development of the child's sleep patterns and problems. • General review of sleep symptoms. • Family history of sleep or other problems. 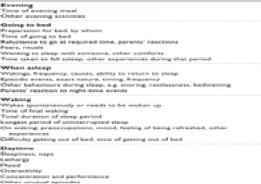 Additional parts of the overall review of children with a sleep problem that are important in order to identify possible contributory factors are as follows. • Developmental history including developmental delays, illnesses, or experiences at school or within the family. • Review of physical health. • Assessment of behaviour and emotional state. • Family history and circumstances. Following the initial consultation, a sleep diary kept over a period of 2 or more weeks can be particularly useful. This provides a more complete and balanced view than that provided especially by fraught parents likely to give a distorted or unbalanced retrospective account.